It is just about time for World Cup 2018. Fans of the participating countries, and unaffiliated fans of the beautiful game, will be focused on cheering for their favorite team in every match. Of course, musicians are not immune to such passions, and have even been known to compose songs about their teams. Some of such songs are good, and some of such songs can even be played in polite company. 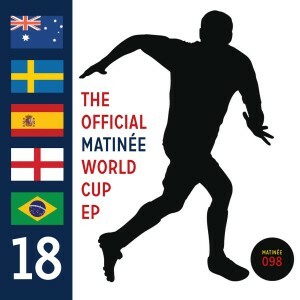 Today we bring you The Official Matinee World Cup EP, a hot-off-the-press compilation from Matinee Recordings featuring songs by five bands whose fellow countrymen will compete for the ultimate prize. Last Leaves from Australia sings of "Golden Days To Come". Sweden's Red Sleeping Beauty is regarding the team "Dressed In Yellow And Blue". The Spanish contribution from The Royal Landscaping Society reminds us who won in "2010". "Red White And Blue" is the The Popguns ode to their English team. Brazil's Pale Sunday contributes "Dirt Pitch Superstars", reminding us of the impromptu pitches that nurture the seemingly endless youth talent supplying their national side. The games begin next week, so now is the time to load up on modern anthems in digital or CD format. We already have our copy, and it will feature prominently at happy hour at least until this WC is over. And because it is good music, and national leagues start up again in August, we'll probably keep playing it.